Let's try to keep two things in mind simultaneously: The IRS does need some kind of test that helps them weed out political organizations attempting to register as tax-exempt 501(c)4 social welfare groups. But that test has to be studiously, unquestionably neutral. The story thus far seems both chilling and cheering. Employees at the agency's Cincinnati branch did employ a test that, in effect, targeted tea party groups. Whether they meant it to be discriminatory or they simply created one that was discriminatory is in contention, but ultimately immaterial. The IRS, more so than almost any other agency, must act in ways above reproach. The context for all this is that after Citizens United and some related decisions, the number of groups registering as 501(c)4s doubled. Because the timing of that doubling coincided with a rise in political activism on the right rather than the left, a lot of the politicized groups attempting to register as 501(c)4s were describing their purpose in tea party terms. A popular conceit, for instance, was that they existed to educate on the Constitution -- even if the particular pedagogical method meant participating in Republican Party primaries and pressuring incumbent politicians. In looking for that kind of language in 2010, the Cincinnati employees were attempting to create a usable shortcut. Like Willie Sutton robbing banks, they were going where the action was. But they needed a clearer test that also identified the language of the left, even if left-leaning groups weren't exhibiting the same surge in activism. And, frankly, it shouldn't have been left to career employees in Cincinnati. The IRS needed clearer rules coming from the top. But the top didn't know what to do with these 501(c)4s, in part because it feared a situation precisely like this one. It is worth remembering an important fact here: The IRS is supposed to reject groups that are primarily political from registering as 501(c)4s. If they're going to do that, then they need some kind of test that helps them flag problematic applicants. And that test will have to be a bit impressionistic. It will mean taking the political rhetoric of the moment and watching for it in applications. It will require digging into the finances and activities of groups on the left and the right that seem to be political even as they're promising their activities are primarily non-political. If we're not comfortable with that, then we need to either loosen the definition of 501(c)4s or create a new designation that gives explicitly political groups the benefits of the 501(c)4s (namely, they don't have to pay taxes and they can keep their donors anonymous). But either way, as I wrote on Friday, the only way to make sure this doesn't keep happening is for the IRS -- or the Congress and White House that control it -- to make some tough decisions about 501(c)4s. Wonkbook's Number of the Day: 52 percent. That's the amount by which sequestration has reduced the value of the Pentagon's new contracts relative to last month. It's down 22 percent from a year earlier, also. 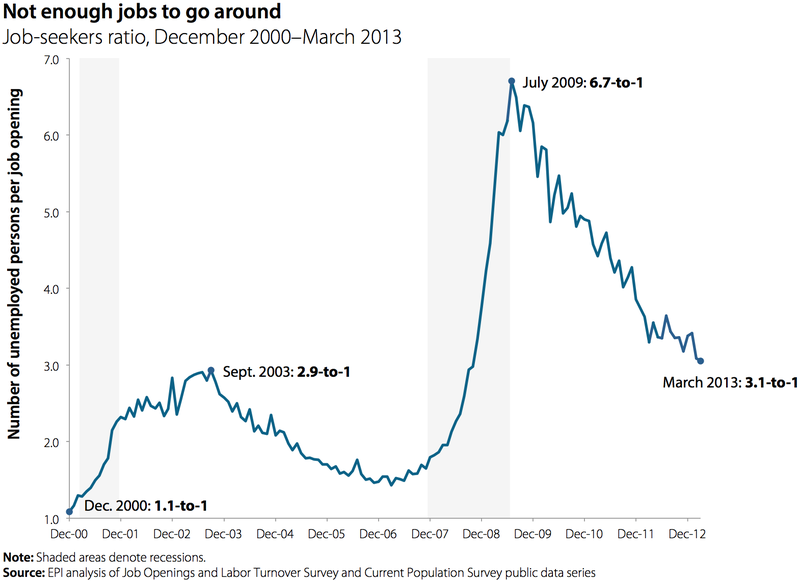 Wonkblog's Graphs of the Day: The job-seekers ratio. Wonkbook's Top 5 Stories: 1) The mess at the IRS; 2) implementing Obamacare; 3) the long wake of the financial crisis; 4) who wants immigration; and 5) next up for monetary policy. IRS targeted right-leaning groups, documents show. "At various points over the past two years, Internal Revenue Service officials singled out for scrutiny not only groups with “tea party” or “patriot” in their name but also nonprofit groups that criticized the government and sought to educate Americans about the U.S. Constitution, according to documents in an audit conducted by the agency’s inspector general. The documents, obtained by The Washington Post from a congressional aide with knowledge of the findings, show that the IRS field office in charge of evaluating applications for tax-exempt status decided to focus on groups making statements that “criticize how the country is being run” and those that were involved in educating Americans “on the Constitution and Bill of Rights.”" Juliet Eilperin in The Washington Post. Explainer: 5 unanswered questions for the IRS. Lauren French in Politico. Conservatives have seized on it. "[T]he accusations of I.R.S. abuse are sure to fuel an effort that appears to be uniting dispirited Republicans and their conservative political base: investigating Mr. Obama and his administration. Republicans are pushing a portrayal of an administration overreaching its authority and punishing its enemies." Jonathan Weisman in The New York Times. The backstory. "Tax-exempt social-welfare groups organized under section 501(c)(4) of the Internal Revenue Code are allowed to engage in some political activity, but the primary focus of their efforts must remain promoting social welfare. That social-welfare activity can include lobbying and advocating for issues and legislation, but not outright political-campaign activity. But some of the rules leave room for IRS officials to make judgment calls and probe individual groups for further information. Organizing as such a group is desirable, not just because such entities typically don't have to pay taxes, but also because they generally don't have to identify their donors." John D. McKinnon and Siobhan Hughes in The Wall Street Journal. What the scrutiny meant. "Those tea-party organizations were sent letters of inquiry demanding information that would seldom if ever be demanded of any other applicant in the process. The IRS demanded lists of donors, names of spouses and family members, detailed information about political views and associations — all of that 'under penalties of perjury.' Many applicants dropped out of the process. The questions were remarkably invasive: For example, the IRS demanded to know not only whether political candidates participated in public forums conducted by the groups, but which issues were discussed, along with copies of any literature distributed at the forum and material published on websites." Kevin Williamson in the National Review. The IRS should've been going after many, many more 501(c)4s. "The problem wasn’t that the IRS was skeptical of tea party groups registering as 501(c)4s. It’s that it hasn’t been skeptical of Organizing for America, Crossroads GPS, Priorities USA and Heritage Action Fund registering as 501(c)4s. The IRS should be treating all these groups equally and appropriately — which would mean much more harshly. Instead, the IRS has permitted 501(c)4s to grow into something monstrous. And if they cower in the aftermath of this embarrassment, it might make matters even worse." Ezra Klein in The Washington Post. Architectural interlude: 10 buildings that changed America. CAMERON: A US-UK trade agenda. "An EU-U.S. deal is just one building block of a more dynamic world economy. If G-8 countries complete all of their current trade deals and those in the pipeline, it could boost the income of the whole world by more than $1 trillion...But as we free up the world economy, we must make sure openness delivers the benefits it should for rich economies and developing countries alike. That means consistent and fair rules for the global economy." David Cameron in The Wall Street Journal. STIGLITZ: Curb intellectual property rights. "More broadly, there is increasing recognition that the patent system, as currently designed, not only imposes untold social costs, but also fails to maximize innovation...[I]t is why research shows that patenting genes actually reduces the production of new knowledge about genes: The most important input in the production of new knowledge is prior knowledge, to which patents inhibit access." Joseph Stiglitz in Slate. REINHARDT: American health care as a source of humor. "[T]he health system in the United States is in many ways so risible that it comes across as droll even when a dour German-born economist describes it...Under the mantra that rules American health care, that “one size does not fit all” — this, in a country that invented one-size-fits-all franchising like McDonald’s and Holiday Inn — the structure and detail of chargemasters are hospital-specific and vary considerably among hospitals." Uwe Reinhardt in The New York Times. STUCKLER AND BASU: How austerity kills. "In the United States, the suicide rate, which had slowly risen since 2000, jumped during and after the 2007-9 recession. In a new book, we estimate that 4,750 “excess” suicides — that is, deaths above what pre-existing trends would predict — occurred from 2007 to 2010. Rates of such suicides were significantly greater in the states that experienced the greatest job losses. Deaths from suicide overtook deaths from car crashes in 2009." David Stucker and Sanjay Basu in The New York Times. DIONNE: Raising the political heat on gun control. "Politicians who tout themselves as advocates of law and order don’t want to be unmasked as caring even more about their ratings from gun lobbyists. And opponents of the most moderate gun reforms engage in a shameless game of bait-and-switch. Because measures such as background checks would not stop every murder, they’re declared useless even though they’d still save lives. Then the gun lobby turns around and opposes other measures, such as a ban on high-capacity magazines, which could prevent some of the killings that background checks might not." E.J. Dionne in The Washington Post. SOLTAS: The Fed's next moves. "What news and what sorts of numbers will convince its members that they can withdraw stimulus -- or that they need to extend or even boost their injections?...They could be looking for three to six months of growth in payroll employment of 200,000 or more each month. That could be the “substantial improvement in the labor market” they have in mind." Evan Soltas in Bloomberg. KONCZAL: The case for a universal basic income. "First, what are some advantages of providing a universal basic income? To those on the left, a UBI would create greater equality by ending poverty and providing a minimum living standard. It would also increase bargaining power for workers, who could demand better working conditions with a safety cushion." Mike Konczal in The Washington Post. KELLER: Dark Heritage. "The Heritage Foundation has never made a secret of its conservative political orientation, but it has generally tried to remain within plausible boundaries of analysis. Heritage gives you data with lots of spin, but tends to avoid being downright outlandish...But on immigration, something else is going on...[T]his is an unusually stark sign of the transformation of Washington’s think tank culture into a more partisan archipelago of propaganda factories." Bill Keller in The New York Times. Internet hivemind interlude: Where in the world is Wikipedia being edited? Budget request denied, Sebelius turns to health executives to finance Obamacare. "Health and Human Services Secretary Kathleen Sebelius has gone, hat in hand, to health industry officials, asking them to make large financial donations to help with the effort to implement President Obama’s landmark health-care law, two people familiar with the outreach said. Her unusual fundraising push comes after Congress repeatedly rejected the Obama administration’s requests for additional funds to set up the Affordable Care Act, leaving HHS to implement the president’s signature legislative accomplishment on what officials have described as a shoestring budget." Sarah Kliff in The Washington Post. ...But HHS says they're in the clear. "HHS spokesman Jason Young said the fundraising push serves the department's basic goals. "Part of our mission is to help uninsured Americans take advantage of new affordable, high quality insurance options that are coming, thanks to the health law," he said. "For the last several months the Secretary has been working with a full range of stakeholders who share in the mission of getting Americans the help they need and deserve."" Sam Baker in The Hill. Dangers found in weak Medicare Part D oversight. "[A]n investigation by ProPublica has found the program, in its drive to get drugs into patients’ hands, has failed to properly monitor safety. An analysis of four years of Medicare prescription records shows that some doctors and other health professionals across the country prescribe large quantities of drugs that are potentially harmful, disorienting or addictive for their patients. Federal officials have done little to detect or deter these hazardous prescribing patterns." Tracy Weber, Charles Ornstein, and Jennifer LaFleur in The Washington Post. Small business worried about tax on insurance providers. "Many small-business owners worry that a new tax on insurance providers in the health-care law will mean higher premiums for them, undermining the law’s capacity to lower their health-care costs. Starting next year, the federal government will charge a new fee on health insurance firms based on the plans they sell to individuals and companies, known as the fully insured market." J.D. Harrison in The Washington Post. @markknoller: HHS today announced $150-million initiative to get uninsured Americans signed up for coverage under ObamaCare. Study: Nearly one third of all death certificates are wrong. "Death certificates are important public health documents. They help epidemiologists understand leading causes of deaths and how they are changing. They power big studies of what killed us in the past — and what kills us now. And, according to a new Center for Disease Control study, about a third of them may be wrong...As to why doctors were reporting inaccurate causes of death, it actually appears to be a weirdly bureaucratic reason: Three-quarters said the system they use in New York City would not accept what they thought to be the real cause of death. So they put in something else instead." Sarah Kliff in The Washington Post. Music recommendations interlude: Commander Chris Hadfield of the International Space Station doing his version of David Bowie, "Space Oddity." "Be regulated? Who? Me?" cry bond-rating agencies. "Lawmakers told the Securities and Exchange Commission nearly three years ago to shake up the bond-rating industry's "issuer pays" business arrangement, where clients pay firms such as Standard & Poor's Ratings Services and Moody's Investors Service for their letter grades. Very little has changed. An SEC report that was widely expected to announce regulatory changes arrived six months late—and proposed more discussion rather than an overhaul." Jeannette Neumann in The Wall Street Journal. Rep. Waters has taken a new attitude towards the banks. "In the past, such grumbling might have set off Ms. Waters’s famous hair-trigger temper. But with each complaint, she leaned in for more, nodding appreciatively. “We’ve heard they chase down silly stuff,” Ms. Waters said, referring to regulators and shaking her head in disapproval. “I’m willing to take a hit” to help lower the capital requirements, she said. She even suggested the bankers hire new lobbyists to better represent them. “Influence us,” Ms. Waters said softly, reminding them of her new role as the ranking Democrat on the House Financial Services Committee. “Help us understand the intricacies of your business.”" Ben Protess in The New York Times. IPOs set for biggest year since financial crisis. "Already this year, 64 U.S.-listed public offerings have raised $16.8 billion, according to Dealogic. In the same period in 2012, the biggest year in dollars since the financial crisis, 73 companies raised a total of $13.1 billion. Last week alone brought 11 U.S.-listed IPOs, making it the busiest week for such deals since December 2007. A more robust IPO market is seen as a potential boon for the economy because it allows companies to raise money that can be used to reduce debt or invest in their businesses." Telis Demos and Matt Jarzemsky in The Wall Street Journal. Explainer: Key economic data coming your way this week. Amrita Jayakumar in The Washington Post. Economic road ahead clearing, but the going is slow. "Experts expect the steady path to continue. In the latest Wall Street Journal survey of economists, forecasters said they expect employers to add just under 180,000 jobs a month over the next 12 months, about the same pace as the past two years. They think overall economic growth has slowed somewhat from the first three months of the year but will quickly rebound; for the full year, economists expect 2.4% growth, better than the past two years." Ben Casselman and Phil Izzo in The Wall Street Journal. OK, one more music recommendation interlude: We could give you "Livin' on a Prayer" by Jon Bon Jovi, or "Sweet Dreams" by The Eurythmics...but we think you'll enjoy this gas station karaoke version more. 4. Who wants the immigrants? The Rust Belt is calling out for immigrants. "Worries over immigrants potentially taking jobs from native-born Americans run high in parts of the nation, but some U.S. cities are taking a different view: Wooing immigrants can reverse long-term declines in population. Cities, mostly in the Midwest and mid-Atlantic states, are betting that attracting foreign-born residents can spur business creation and revive neighborhoods. Steps vary from proclamations welcoming immigrants, to adding staff focused on attracting newcomers and translating government websites, to efforts to connect international students with local companies." Mark Peters and Jack Nicas in The Wall Street Journal. ...And some countries are lobbying to send us more. "[Some countries] succeeded in winning provisions in the fine print of the 867-page immigration bill now before Congress that give their citizens benefits not extended to most other foreigners. Ireland and South Korea extracted measures that set aside for their citizens a fixed number of the highly sought special visas for guest workers seeking to come to the United States. Poland got language that would allow it to join the list of nations whose citizens can travel to the United States as tourists without visas. And Canadians successfully pushed for a change that would permit its citizens who are 55 and older and not working to stay in the United States without visas for as much as 240 days each year, up from the current 182." Eric Lipton in The New York Times. Why Sen. Lee wants to exempt household help from immigration enforcement. "Among them is an offering from Sen. Mike Lee (R-Utah). The libertarian-leaning Republican proposed an amendment to exempt “cooks, waiters, butlers, housekeepers, governessess, maids, valets, baby sitters, janitors, laundresses, furnacemen, caretakers, handymen, gardeners, footmen, grooms, and chauffeurs of automobiles for family use” from E-Verify, the federal government’s system that enables employers to check on the legal status of their employees...That vaguely aristocratic connotation earned it the moniker of the “Downtown Abbey amendment” from Adam Serwer at Mother Jones. Unsurprisingly, Lee’s office objects vehemently to this characterization." Dylan Matthews in The Washington Post. Delicious interlude: Kids tasting some types of food for the first time. And in slow-mo, of course. Fed maps exit from stimulus. "Federal Reserve officials have mapped out a strategy for winding down an unprecedented $85 billion-a-month bond-buying program meant to spur the economy—an effort to preserve flexibility and manage highly unpredictable market expectations. Officials say they plan to reduce the amount of bonds they buy in careful and potentially halting steps, varying their purchases as their confidence about the job market and inflation evolves. The timing on when to start is still being debated." Jon Hilsenrath in The Wall Street Journal. If Yellen's the next head of the Fed, her big challenge is exit strategy. "Ms. Yellen is a top contender for the job, assuming Mr. Bernanke steps down when his term ends in January, but her selection is far from certain. She faces a big question among investors: Is she wary enough about the risks of easy money to close the Fed's credit spigot before financial bubbles emerge or consumer prices rise too far?" Jon Hilsenrath in The Wall Street Journal. U.S. dollar rises on bets Fed will be first to unwind stimulus. "As the U.S. economy showed signs of sustained improvement in past weeks, currency markets have increasingly come to reflect the belief that the Federal Reserve would slow—or even stop—its bond purchases, effectively a way of printing money. This would put upward pressure on the dollar because fewer dollars would be injected into the economy." Rebecca Howard in The Wall Street Journal. The mystery of Ben Bernanke and the Japanese ketchup, solved. Neil Irwin. Why it's hard to campaign your way to the presidency. John Sides. Why aren't Americans moving anymore? Brad Plumer. Why Mike Lee wants to exempt household help from immigration enforcement processes. Dylan Matthews. Thinking Utopian: How about a universal basic income? Mike Konczal. The fringe universe of Sen. Rand Paul. Ezra Klein. Study: Nearly one-third of all death certificates are wrong. Sarah Kliff. A longread: Frmr. Sen. Snowe has a new book out this week, "Fighting for Common Ground." Amazon. Republican delays on nominees raise tensions in Congress. Jeremy W. Peters in The New York Times. Automatic cuts send Pentagon contract awards down 52 percent. Nick Taborek in The Washington Post.